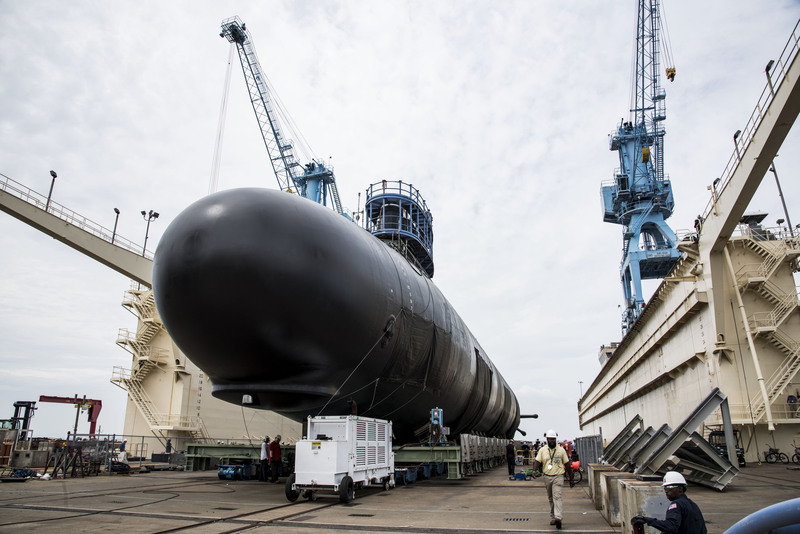 Huntington Ingalls Industries (HII) announced on Jun 09, 2017 that the Virginia-class submarine USS Indiana (SSN-789) was launched into the James River at the company’s Newport News Shipbuilding division. 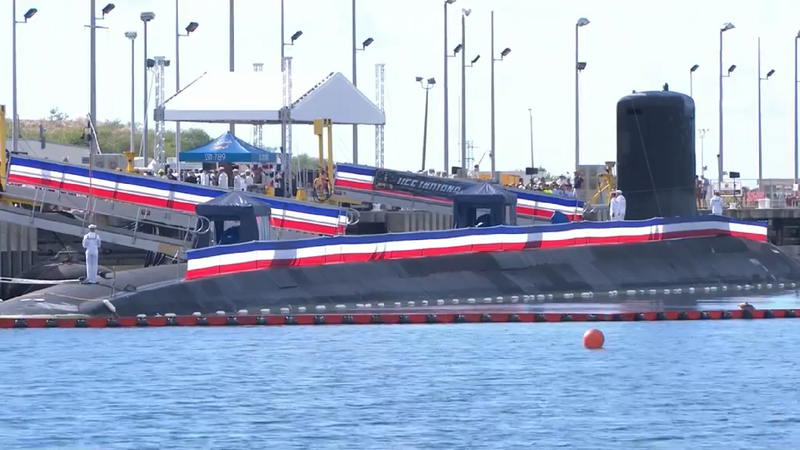 The boat was moved to the shipyard’s submarine pier for final outfitting, testing and crew certification. 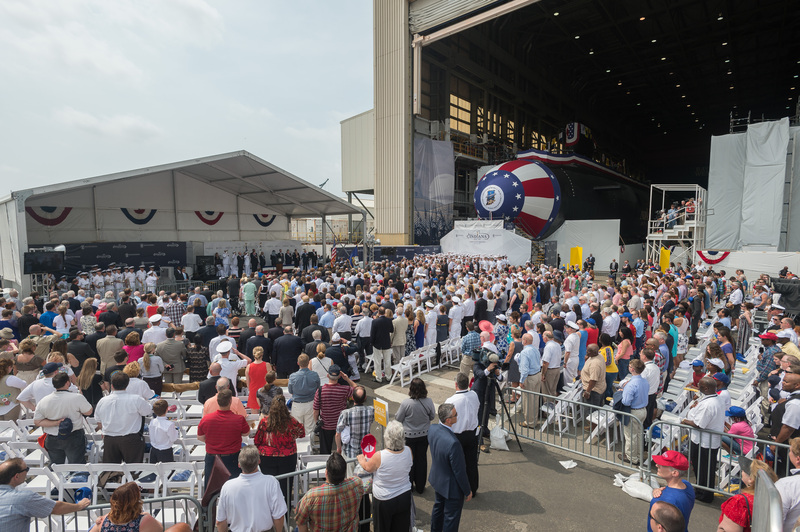 «Launch is a true testament to our shipbuilders’ roughly four years of hard work», said Matt Needy, Newport News’ vice president of submarines and fleet support. 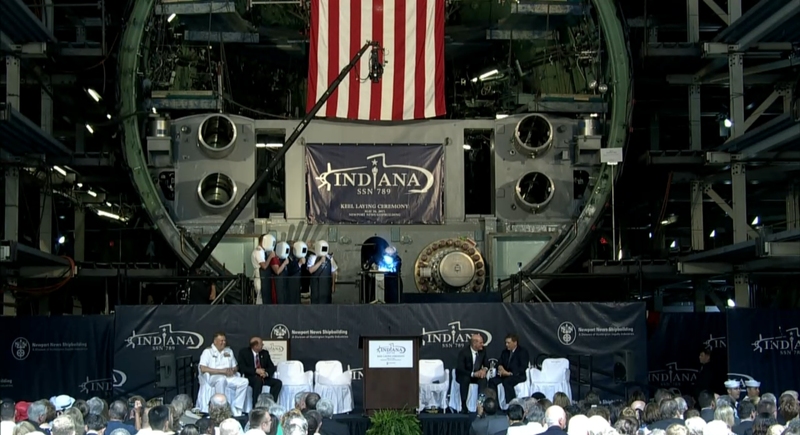 «Over the next several months, we will work closely with the Indiana crew to bring this great ship to life. 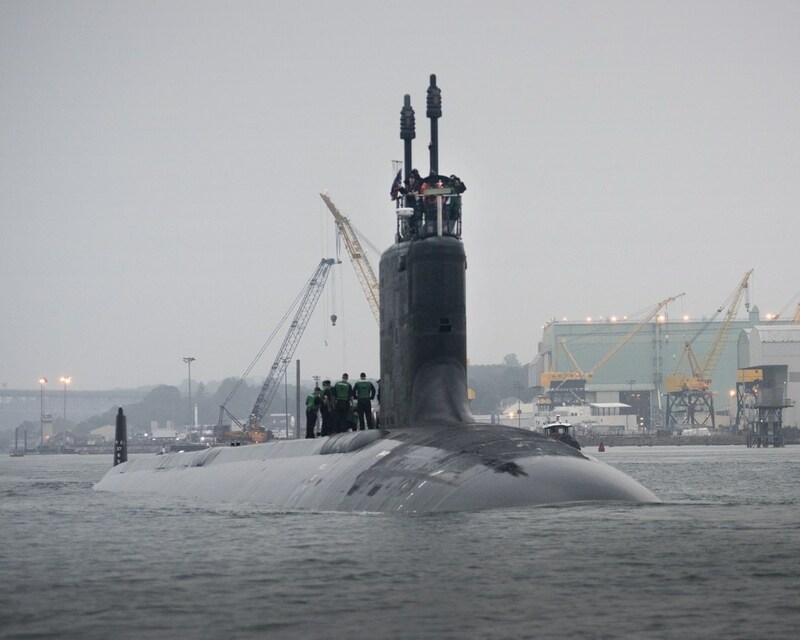 With the Navy’s recent increase in SSN force structure requirements from 48 to 66 submarines, the shipbuilders here at Newport News and at our teaming partner, Electric Boat, understand the importance of getting these highly valued ships delivered and ready for mission-tasking by our Navy leadership». USS Indiana (SSN-789) a is the 16th Virginia-class submarine and the eighth that will be delivered to the U.S. Navy by Newport News. 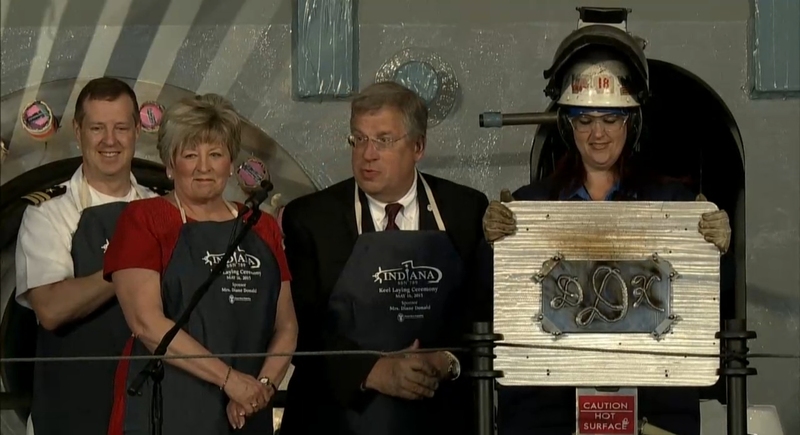 Nearly 4,000 shipbuilders have participated in Indiana’s construction since the work began in September 2012. 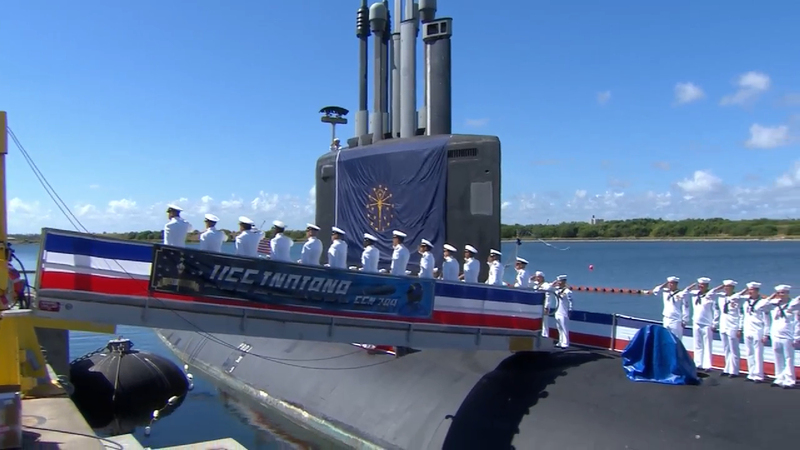 «Our Indiana sailors are honored to be at the helm as the newest Hoosier boat launches into a new chapter at sea», said Commander Jesse Zimbauer, Indiana’s commanding officer. 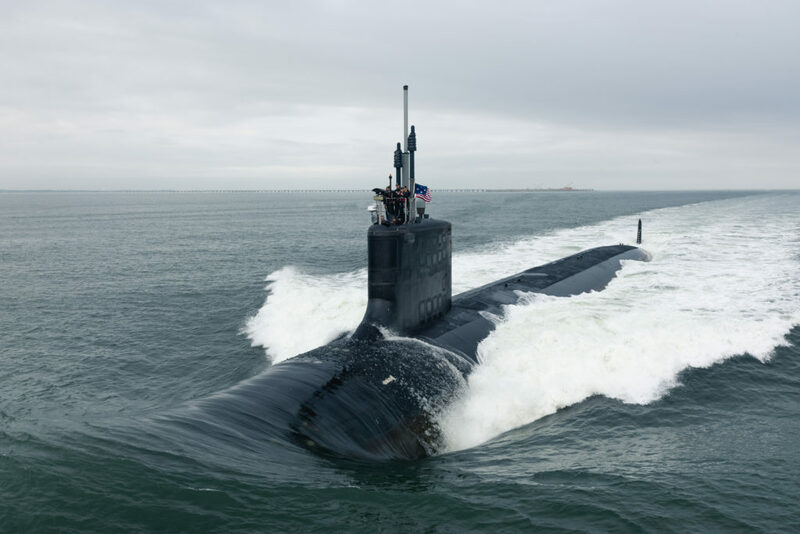 Virginia-class submarines, a class of nuclear-powered fast attack submarines, are built for a broad spectrum of open-ocean and littoral missions to replace the Navy’s Los Angeles-class submarines as they are retired. Virginia-class submarines incorporate dozens of new technologies and innovations that increase firepower, maneuverability and stealth and significantly enhance their warfighting capabilities. These submarines are capable of supporting multiple mission areas and can operate at submerged speeds of more than 25+ knots/28+ mph/46.3+ km/h for months at a time. On April 29, Huntington Ingalls Industries’ (HII) Newport News Shipbuilding division celebrated the christening of Indiana (SSN-789), the 16th Virginia-class submarine. 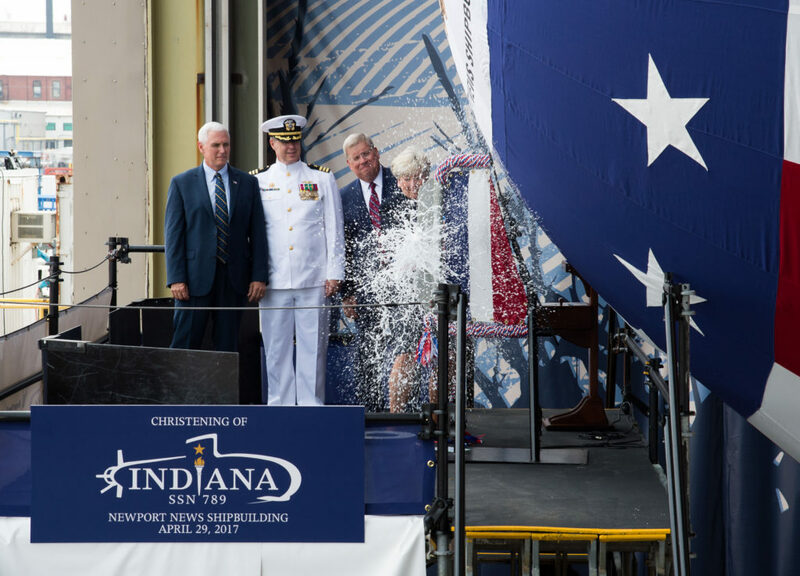 With a single swing, ship’s sponsor Diane Donald performed the traditional honor of breaking a bottle of American sparkling wine across the submarine’s hull. Donald is the wife of Admiral Kirkland Donald (U.S. Navy, Retired), former director, Naval Nuclear Propulsion. «It’s the honor of a lifetime to be here today», said Donald. «While the size of the submarine alone is stunning, the complexity inside sets it apart from any other machine ever built. These ships are second to none, made in America by truly remarkable Americans». Vice President Mike Pence, former governor of Indiana, served as the ceremony’s keynote speaker. Today is the 100th day since he and President Donald Trump assumed office. «He sent me here today on this historic occasion as a sign of his deep commitment to the Armed Forces of the United States of America, and to his commitment to make the strongest fighting force in the world even stronger still», Pence said of Trump. Speaking to the shipbuilders, he acknowledged their dedication and skill. «You have the gratitude of the commander in chief for your unwavering commitment to your country, your patriotism, your craftsmanship, and rest assured, President Trump will honor your commitment with historic investments in our national defense». Other ceremony participants included Representative Bobby Scott, Democratic Party-Virginia; Senator Joe Donnelly, Democratic Party-Indiana; Secretary Sean Stackley, acting secretary of the Navy; Vice Admiral Joseph Tofalo, commander, Submarine Forces; Admiral Tom Fargo (U.S. Navy, Retired), chairman of the board, Huntington Ingalls Industries; Mike Petters, president and CEO, Huntington Ingalls Industries; Matt Mulherin, president, Newport News Shipbuilding; and Jeffrey Geiger, president, General Dynamics Electric Boat. Stackley spoke of the U.S. Navy’s important presence around the world. «More than a hundred U.S. Navy ships are underway, providing assurance to our allies, maintaining persistent surveillance in regions of interest, conducting special operations undetected, safeguarding the choke points of the world, standing poised to assure access to strike if necessary, and providing humanitarian relief if needed. 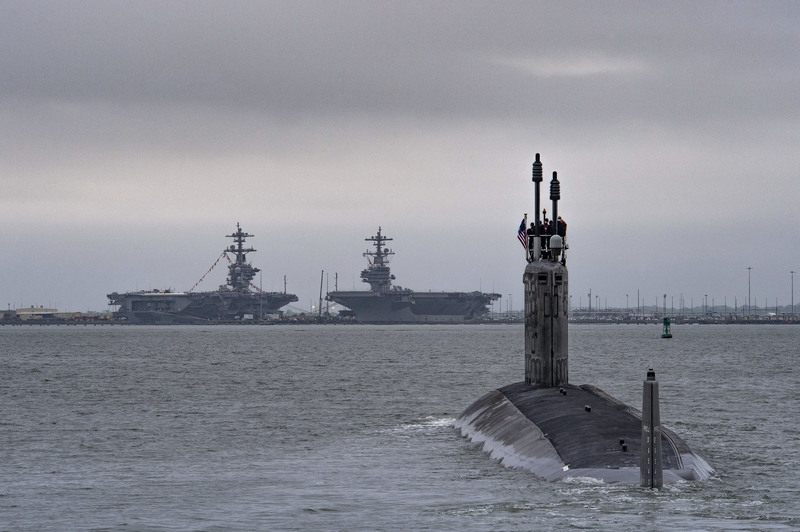 And all the while, Navy ships are serving as the enduring, reliable deterrent that underpins our nation’s security». 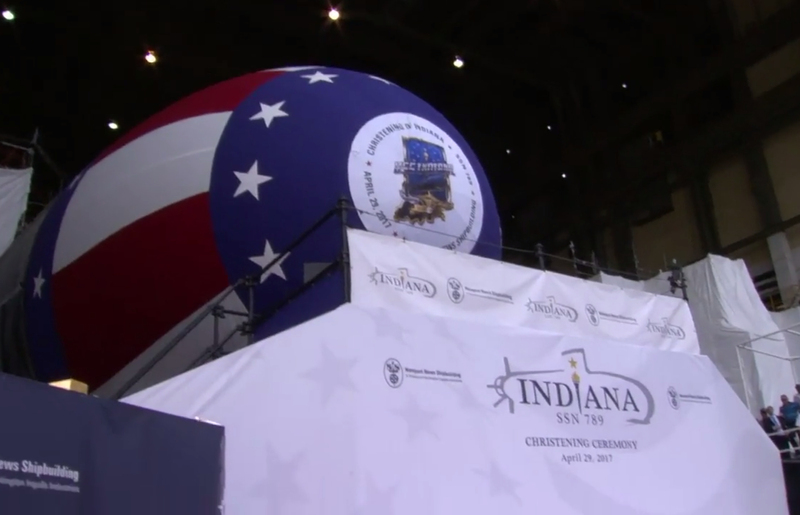 Speaking on behalf of the state of Indiana, Donnelly thanked the shipbuilders for their service to the U.S. Navy and the Indiana crew. «This crew is going to be at the very tip of the spear», he said, «and you have given them the tools, the equipment, the ability to accomplish everything». 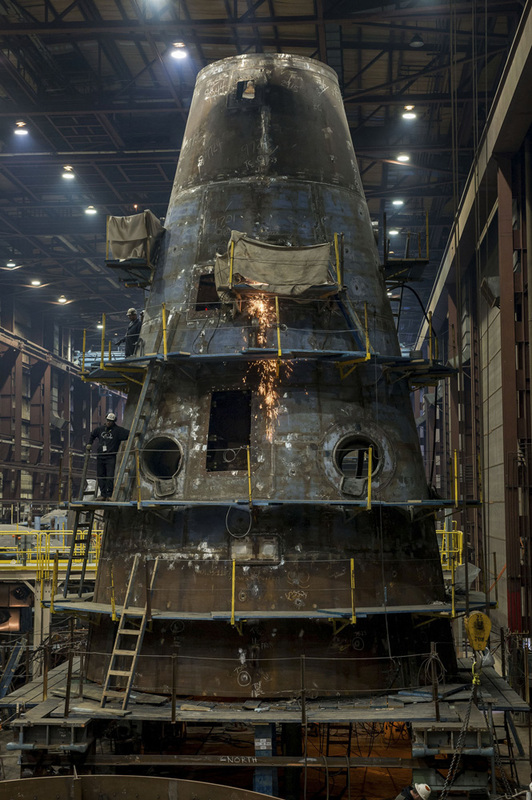 About 4,000 Newport News shipbuilders have participated in Indiana’s construction in partnership with General Dynamics Electric Boat. Construction began in September 2012 and is about 90 percent complete. 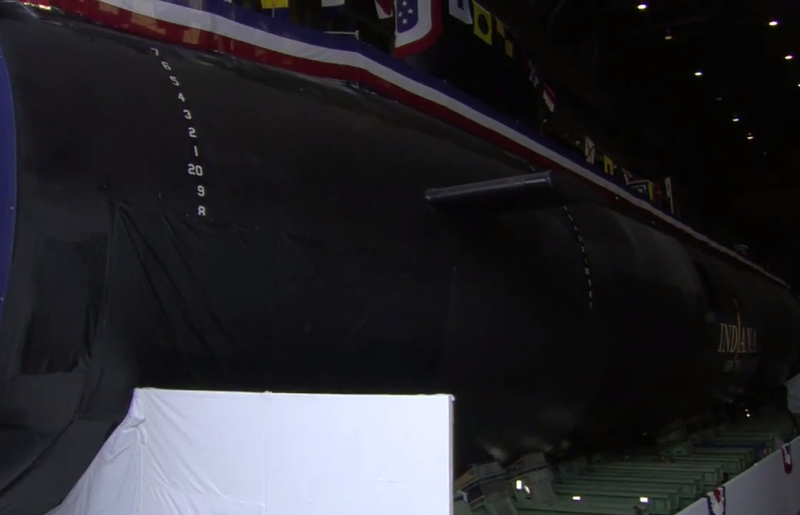 The submarine is on track to deliver to the U.S. Navy this year. 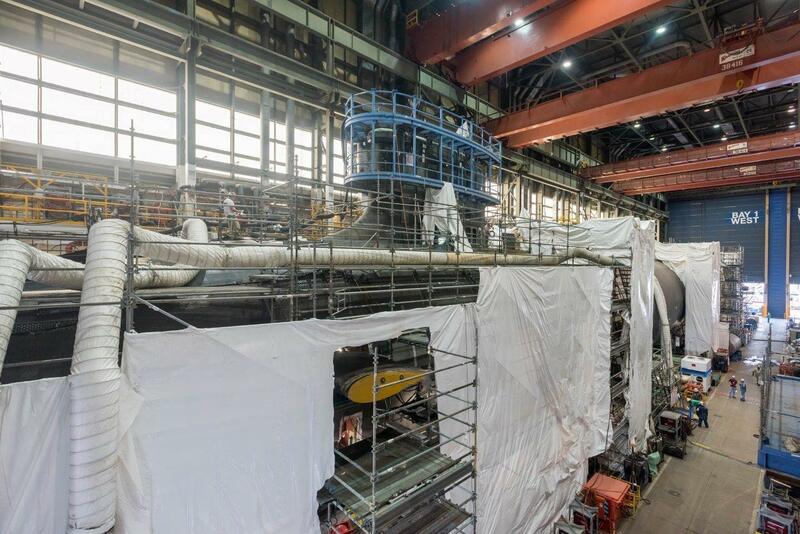 «It’s hard to describe what it’s like to build one of the most complex machines in the world», said Newport News Shipbuilding President Matt Mulherin. 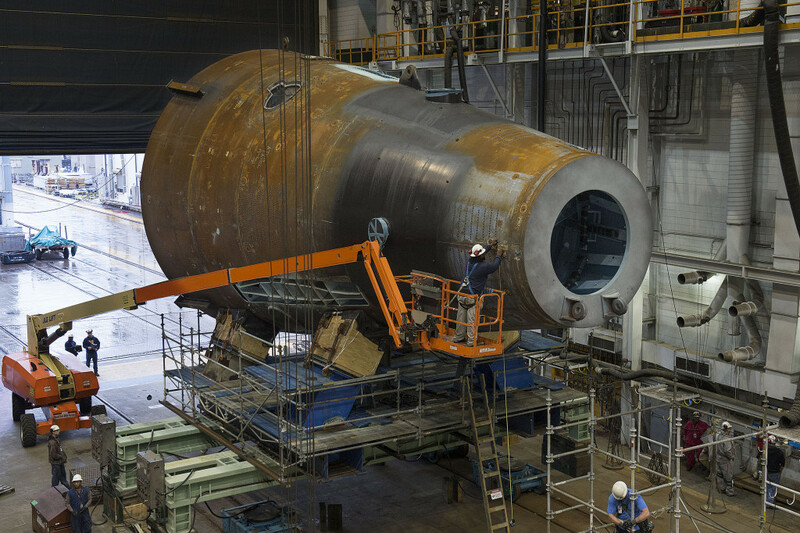 «For our shipbuilders who do this every day – they can even lose perspective of the contributions they are making to our Navy and to our nation. For them, it’s all part of a day’s work – a long, hard, honest day’s work. However, as you look upon this magnificent vessel, I think you’ll agree, it’s no ordinary job. In fact, it’s pretty extraordinary. Our shipbuilders define what ‘Made in America’ means». 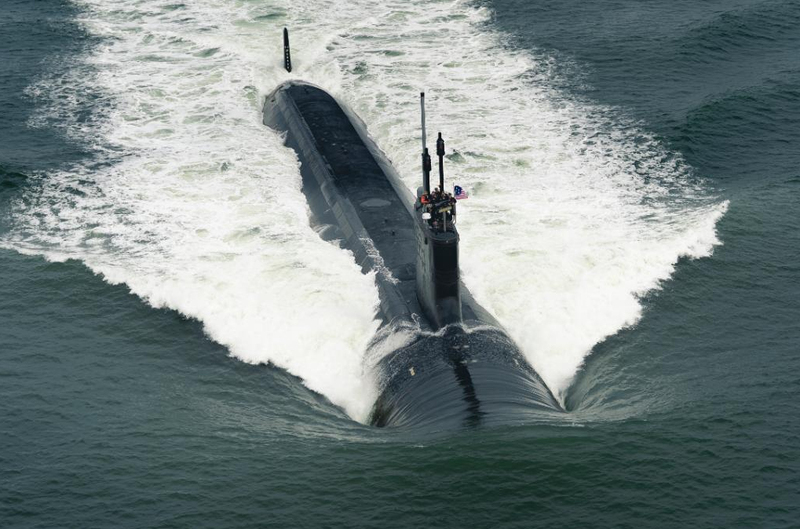 Virginia-class submarines, a class of nuclear-powered fast attack submarines, are designed for a broad spectrum of open-ocean and littoral missions to replace the Navy’s Los Angeles-class submarines as they are retired. 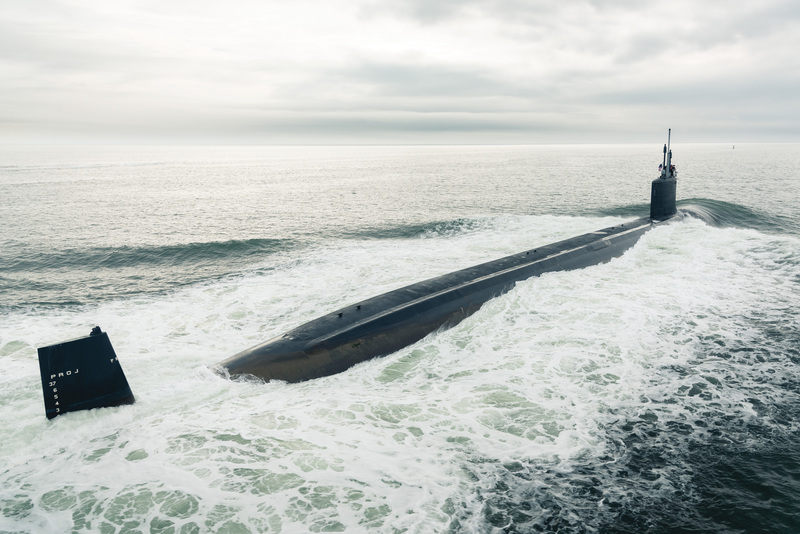 Virginia-class submarines incorporate dozens of new technologies and innovations that increase firepower, maneuverability and stealth, and significantly enhance their warfighting capabilities. These submarines are capable of supporting multiple mission packages and can operate at submerged speeds of more than 25+ knots/28+ mph/46.3+ km/h for months at a time.